Most of us have a lot of bands and artists they like and even some they really love. I immediately think of my mother’s love for (the music of) Bruce Springsteen and remember my father getting emotional when dusting off his old vinyls. It could also be your niece that is crazy about One Direction or even guilty pleasures of friends that are secretly in love with local pub performers. Artists have the potential for you to connect with and feel passionate about. In other words, they lend themselves perfectly for the Relationship religion. An artist’s success is partly sized by their share of fans. But there is more to the story, as we see successful artists building not only large, but also very dedicated and loyal fan bases around them. 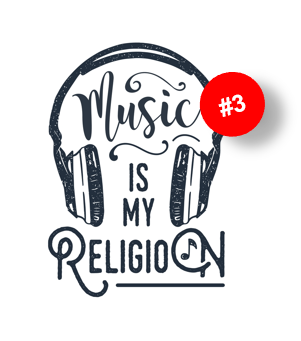 We found that many aspects in the music industry go hand in hand with the Brand Religions, defined by InSites Consulting. In previous posts in this series, we already shed our light on the Penetration Religion and the Influencer Religion. In this post, we will elaborate on the Relationship Religion. The Relationship Religion is all about the connection between consumers and brands, made famous by literature on the anthropomorphism of brands (allocating human traits to brands). Brands play a significant role in a consumer’s daily life and this connection is often more affectionate than purely relevance-based; consumers have relationships with brands. Hence, this religion emphasizes the importance of emotions and of building an emotional connection with consumers. Music and emotions are inextricably linked and brands often use music to prime emotions in communication and brand activation efforts. On top, many artists are seen as love marks in a way most brands can only dream of. They showcase a strong story, image and/or theme which consumers can identify with, building a solid ground for a true relationship. They inflict love that seems to stream both ways. Think about artists that became the ‘mother’ of their fan base by naming it, such as Beliebers (Justin Bieber), Lambs (Mariah Carey), Katycats (Katy Perry), Smilers (Miley Cyrus) and Little monsters (Lady Gaga). All of the above underline how close music and artists are to the Relationship Religion. Lady Gaga acquired a huge fan base over the years, which did not go without effort. She carefully built her fan base, first by extensively touring, as her manager explains: “We wanted to build her fan base from the ground up. Once the audience feels they own something, they are going to run with it, and do the work for you.” Instead of delivering her message to the masses, Lady Gaga deliberately chose to be active in more extravert (and maybe not so popular) scenes like dance, fashion, art & gay communities, creating a credible & unique artist DNA. Furthermore, she spread a strong story on female empowerment and social equality, and took a stand in politics. Many could identify to the image and strong but honest opinion, and all of them were united through Gaga’s music. Building a fan base and maintaining a close relation with it is definitely not unique. However, Gaga was the first artist to take this relationship one step further by naming her fan base; her ‘Little Monsters’ were born. Through this the relation grew stronger: being a fan now means belonging to something bigger. She created a network of like-minded people from around the world, that interact with each other online. As any group these days, Little Monsters even have their own symbol: making a ‘claw’ with your hand. Following Gaga’s success, other artists too started renaming their fan bases to become catchy communities. The Little Monsters are true, loyal and active community members, as can be seen in the examples summed up by Forbes. But there’s no such thing as a free picnic; Gaga actively invests in this loyalty. Shortly before the release of the album ARTPOP, the Little Monsters came up with the podcast ‘Radio ARTPOP’ on all Gaga’s activities. Lady Gaga honored the initiative by leaking snippets of new songs to Radio Artpop and tweeting the following about the show: “Watching u become friends, share stories+have creative discussions. Best gift u could give me.” Lady Gaga interacts with her digital-generation fans over social media and embraces other digital tools to fortify the relationship with her Little Monsters. Brand Religions, the paradox of choice? In this series of blogposts (3), we went on a musical journey to discover different schools of thought defined as ‘Brand Religions’. We learned that these religions (also) apply to many facets in the music industry and there are mutual learnings for brands & marketers in other branches. We digested music cases which go hand in hand with specific Brand Religions. Which raises the question: ‘Which brand strategy (independent of product or artist branding) to choose?’ Well, there is no right or wrong and each religion – although contradicting in some aspects – has its truths. Applying a strategic focus is vital, and which exact focus depends on a brands life stage, goals and vision. Select the framework based on this and follow it with great devotion and continuation over time. Yet, one religion won’t per se exclude another. A good example of a cross-over between the Relationship Religion and the Influencer Religion is the release of Wild World, by UK band Bastille. When their new album was released, the band called their fan base, aka ‘Stormers’, to action to create ‘a storm’ by streaming songs of the new album. The streams were visualized on a special website called ‘Eye of the Stormers’ and the band would come to the cities with the most streams and perform for the most-streaming fans. Bastille’s approach can be called a success. In the UK, the album was the 10th most streamed within the first week. Already on day one, the website was responsible for an additional 750,000 streams, which made Bastille the 4th most streamed artist in the UK and the US. Furthermore, fans encouraged other Stormers in their cities to stream the new album so that the band would visit their city. Building a strong fan base through the Relationship Religion and using the right tools in the Influencer Religion to activate them later into a viral ‘storm’ around the world is a great example of how these religions overlap and fortify each other when executed well.